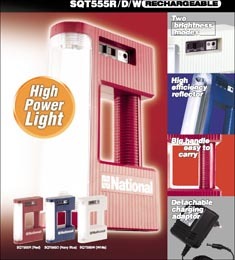 These compact portable lamps have an integral rechargeable lead acid battery, eliminating replacements. One full charge (24 hours) gives 5 to 7 hours of operation. All are equipped with built-in chargers that plug into the wall outlet for intermittent or continuous recharging. UVA-26 - Two 6 watt long wave (365 nm) self-filtered tubes. CW-26 Cool White Lantern - Two 6 watt cool white fluorescent tubes. In recharge state, the lantern automatically turns on when a power failure occurs. Also ideal for emergency use. Dual Tube models can operate with either tube or both tubes simultaneously. Single tube operation extends battery life while dual tube operation substantially increases the output intensity. Each lamp utilizes a specular high UV reflectance reflector multiplying and focusing UV irradiance. Extended-life UV transmitting filter resists solarization, provides surface for thousands of hours in short wave and mid-range models. Engineered for easy operation, comfortable use and reliability. Rugged ABS plastic shell. Ideal for use in non-destructive testing, mineralogy, security control, genetic research, field UV fluorescence analysis, art conversation, antiques, leak detection and more.